I keep thinking about yesterday’s post and worrying about how I could have expressed my concepts concerning future space settlement better. I also want to vehemently state that I don’t want for humankind to use up the world and then move on: whatever happens, there is only one earth. We need to stop abusing it and using it up with our follies and treat it like the sacred blue jewel it is. We will come back to this with better explanations and more cogent ideas, but right now the haunting thoughts of ecocide and possible roads to salvation won’t leave me alone. I am going to take refuge from visions of a ruined world with one of my favorite things: Flemish religious art! Even in this brief passage, the Bible contradicts itself! But, even if you do not think The Good Book is the only source of worthwhile knowledge, it is certainly a peerless work of literature. The illuminated picture perfectly captures the spirit of the poetry. All of the remaining humans and the last animals are packed together in the ark, silent and solemn staring out at the dying world. All animosity between predator and prey is forgotten as their frightened eyes take in the divine flood, which is captured with all of the ghastly verisimilitude that the artists could muster. Forests and drowning creatures drift by the tallest church steeples of a city as rich and poor alike perish in the inundation. For at least as long as we have been able to set down our ideas in words and images, we have looked upon the changes we are making to the world with troubled eyes and we have wondered what it means. I am not sure that our anxiety or our heavy hearts will alter the ultimate destiny of humanity, but I think the fact that we are always worrying about whether we have corrupted the way of righteousness might be a point in our favor. Every year for Saint Patrick’s Day, I have put up a post about Celtic mythology/folklore. In the past these have been about magical beings like leprechauns, the Leannán Sídhe, or the horrifying Sluagh. Sometimes these posts have been complete stories like the tale of Oisín and the princess from Tír na nÓg, the land of the forever young (shudder). These myths are metaphors for the beauty and sadness of life. they focus on the impossible paradoxes of people’s hearts. Yet lately my personal focus has been on fish-themed art which is symbolic of humankind’s increasingly problematic relationship with nature itself–our never-ending drive to consume the world of life that we are inextricably part of. What if there were a tale that combined these elements? Well…in the most ancient Irish myths there was a figure known as the bradán feasa, “the salmon of knowledge.” The salmon was an ordinary salmon who ate nine hazelnuts which fell from the tree of knowledge and tumbled into the mortal world. The fish knew all of the wisdom of nature: it knew the reason the sun shines, the mysteries of the deep ocean, and the secrets of the green forest…it even knew the hidden truths of people’s hearts and why they do what they do. For years and years the great sage Finegas fished the River Boyne trying to catch the salmon so he could devour it and gain its knowledge of all things. The salmon (obviously) already knew what Finegas was up to, and it was no easy prey, but alas, it also knew the end of the myth and so, one day, it reluctantly succumbed to Finegas’ hook. Finegas was exultant. Soon he would know all of the hidden secrets of the world. He gave the fish to his apprentice, Fionn, to cook along with explicit instructions not to eat a single bite of the fish. Dutifully Fionn built a great blaze and set about cooking the enormous fish, but as he repositioned the bronze cooking vessel, he burnt his thumb and he unthinkingly popped his finger into his mouth. Here is an illuminated page from the Da Costa Book of Hours which was illustrated by Flemish master Simon Bening around 1515 AD. Bening was regarded as the last great Flemish illuminator. His illustrations (somewhat like “The Shepheardes Calender“) chart the months of the year through sensitive landscapes filled with hard-working farmers and gardeners. 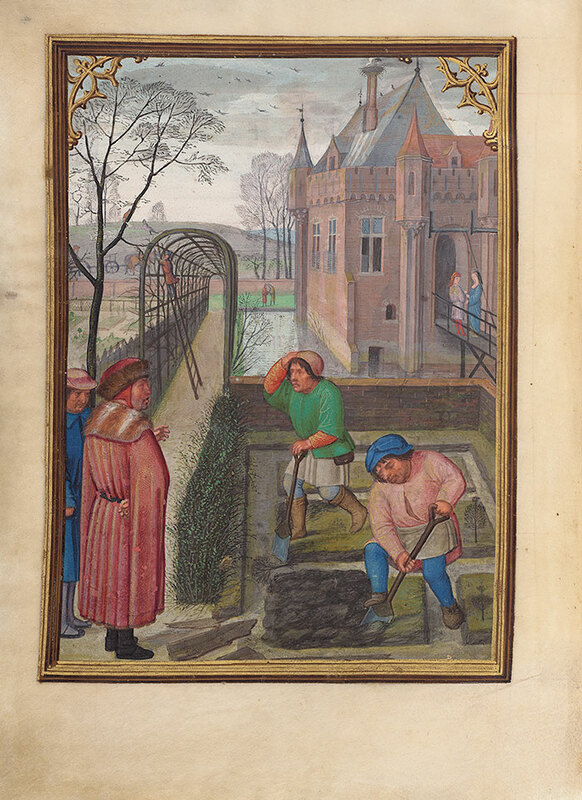 It is a remarkable and rare work in the canon or art in that the workers look like they are actually working, but are neither bumpkinish figures of fun nor beautiful superhumans (although they are brilliantly attired in expensive new garb). The book was made for the Sá family of Portugal (it is a Sephardic surname). This is the illustration for the month of March when winter has not yet left the land, yet the first green shoots are appearing. The gardeners are hard at work laying in the new garden and repairing the trellised avenue as a fur clad nobleman explains what he wants. Note the courtly nobles holding hands on the bridge and the stork nesting on the chimney of the handsome little gothic chateau. It is not a secret that my least favorite month is February. Winter keeps holding on with grim ferocity while the joys of spring are, at best, far away. Every year when the end of winter comes around I keep looking out at the garden waiting for the first green shoots to appear. But the garden is still a sea of gray rubble and dead stalks (plus I failed to plant windflowers or snowdrops and the crocuses and hellebores have yet to flower). So this year, instead of going all the way outside (where it sounds like there is a windstorm), I went to the internet to find some early blooming flowers and I came across the witch hazels (the family Hamamelidaceae). I have encountered them before–in liquid form as an astringent aftershave, however the living plants turn out to be very lovely in a small wilderness meadow sort of way. There are four North American species of witch hazels and two Asian species (one from China and one from Japan). They are small deciduous shrubs/trees with large oval leaves. The American species are also known as winterbloom (which should have served as a hint that they bloomed in the cold season). The picture at the top of the post is the Chinese witch hazel ((H. mollis) currently blooming at the Brooklyn Botanic garden. Witch hazels have red and yellow flowers with droopy corkscrew petals. From a distance these have a winsome loveliness, but up close they are pretty crazy–like a Murano glassblower got the hiccups or an abstract expressionist sent you a bouquet. Here is a little gallery of witch hazels which I lovingly stole from around the web. Branding is a powerful force, and I have always assumed that these plants were used in ancient magics by various priestesses, enchantresses, sorceresses, and other suchlike lady thaumaturges. Imagine my distress to learn that the witch hazels are in no way affiliated with witches or any other sort of dark magic. Apparently this version of the word “witch” comes down to us from the Old English word “wice”, which means pliant or, uh, bendy and is unrelated to the magical sort of witch. Thanks a lot, English, what other misleading homonyms do you have lying around the garden beds. Anyway enjoy the witch hazels and pretty soon we will go out and look at some proper spring flowers (if and when the wind calms down). One of the more endearing woodland creatures of the Appalachian hardwoods where I grew up is the southern flying squirrel (Glaucomys volans). My uncle was always fighting with one that was storing its winter nuts in the roof of the ramshackle log cabin owned by my great-great grandfather. The nocturnal creatures have huge anime eyes which glisten in their small anxious faces. They are extremely social and clever at stocking their winter larder. Although we think of them as subsisting on nuts, this is really their winter provender: during the clement months they eat a wide diet of berries, buds, mushrooms, and flowers…as well as invertebrates, small animals, eggs, and even nestlings (I always imagine the original ancestors of the primates were not unlike the clever and versatile squirrels). Coincidentally, flying squirrels do not fly, but can glide from tree to tree by stretching out their special sheetlike membrane (which is called a patagium). One would think that we would know all there is to know about flying squirrels–perhaps not the species in remote forests of Vietnam, but at least the three American species (there are also two closely related northern species: Glaucomys sabrinus & Glaucomys oregonensis). Yet this turns out to be wrong. This year (2019), Jonathan Martin, a professor of forestry in Wisconsin, was exploring the forest at night with a black light when he made a shocking discovery. He heard some squirrels rustling in his bird feeder and turned the light on them and discovered that, under ultraviolet light they fluoresce hot pink! The North American genus (Glaucomys) of flying squirrels have a rave-tastic secret color. Sadly most of the photos I could find of this phenomena, were pictures of sad little moth eaten flying squirrel pelts in natural history museums, but here is a black light picture which shows that it is the pale bottom half of the squirrel which glows pink under UV light. Hidden UV patterns are common among flowers and invertebrates (spiders and scorpions are particular masters). Even parrots and amphibians are known to utilize splotches of fluorescent color for secret in-species communications. Yet fluorescent coloration was unknown in mammals until present. The discovery is so new that we don’t yet know what it is for…or even whether it is a trait shared by some off the numerous old-world flying squirrels. More research is necessary, and Ferrebeekeeper will try to keep up with the theories (I suspect that, as with parrots and spiders, it is a way for squirrels to keep track of each other in the three dimensional maze of dark forest canopies). Still it is good to see that this mainstay of childhood joy from 1980s skateboards and puffy stickers has a natural home in the great forests of North America. The producers of Miami Vice would be proud…although perhaps they would be dismayed to see that the squirrels’ white light colors are normal earth tones. It is the first day of October, which means you need to start getting ready for Halloween horror coming to Ferrebeekeeper at the end of the month! Every year we have done a special theme week to highlight the monsters lurking in the many shadows of existence. As all of you know, there is darkness out there: it lurks just beneath our appetites, our skin, our mortal lives…Ye! there is a ghastly void beneath the pretty autumn flowers themselves! As a teaser of things to come later this month, I am doubling back to an earlier post which had one of my drawings in it. The drawing was hard to see in that post (because WordPress seemingly no longer blows images up to true size if you click on them) however it took me an enormous amount of time and it looks very ghastly and disconcerting in the real world. It is another one of my allegorical flounder drawings, but this one concerns the hunger, carnage, and obliteration which, alas, seem to be ineluctable features of all systems involving living things…perhaps of all systems, full stop. There is a story I imagined while drawing this: what if you were wandering through the barrowlands of Europe when you found an ancient flatfish made of hammered gold? You would grab the treasure and begin to carry it off, however closer examination might give you pause, for, graven into the solid gold, are vile butchers, sorcerers, monsters, and dark gods. Assembled on the surface of the piece are a monster andrewsarchus, an underworld goddess leaping out of a well with entrails in her hand, cannibals, and a parasitic tapeworm thing. All of these frightful entities are gathered around an evil sentient tree with hanged men it its boughs, and the entire tableau is on the back of a terrible moaning flatfish which seems almost to writhe in your hand. When you look up at the sky the night is descending on the wold. The megaliths take on a sinister new aspect and the very stars seem inimical. it is all too easy to imagine the black holes eating away the center of each galaxy. With dawning fear you realize you need to put this unearthly artifact right back where you found it.